Today’s digital cameras come with a few basic memory card management utilities built right into the on-screen menu interface. While a few of us will find the ability to delete photos and format cards on-the-fly immensely useful, many more of us will end up with inadvertently deleted photos and tragically erased memory cards. If you find yourself with a blank SD card before you’ve exported your photos to a computer, don’t despair. There is a good chance that you can get some or all of those photos and videos back. There are literally hundreds of file undelete or data recovery programs readily available off the shelf or on the web. But a few stand out among the crowd. PhotoRec is a popular open source photo recovery tool that runs under Linux, Mac OS X, and Windows. Pros: It’s free and uses read-only access on your device. Plus, it’s designed for recovering photos. Cons: As a command line interface program, it may be a bit advanced for most users. Be prepared to spend a significant amount of time reading the documentation before using PhotoRec. Data Rescue PC 3 is a do-it-yourself data recovery program that’s well supported and easy to use. Pros: General data recovery software, includes support for multimedia. Cons: Costs upwards of $100, designed for Windows XP (though it may work on later versions of Windows). R-Undelete is a best of both world solution, that combines an incredibly intuitive user interface with advance file recovery technology. Pros: Dead simple wizard-style interface, works on all major operating systems, and supports a wide range of file systems. For home users, there's R-Undelete Home program that recovers files from FAT/exFAT devices for free, without registration. Almost all SD cards are formatted as FAT/exFAT devices. Cons: Costs around $29.99 to $54.99 for the full version. However, free R-Undelete Home lets you preview the files that you can recover before you register. That way, you can be sure that you are getting your money’s worth. Chances are, if R-Undelete can’t recover your files, no other program can, so it’s a good place to start, risk-free. 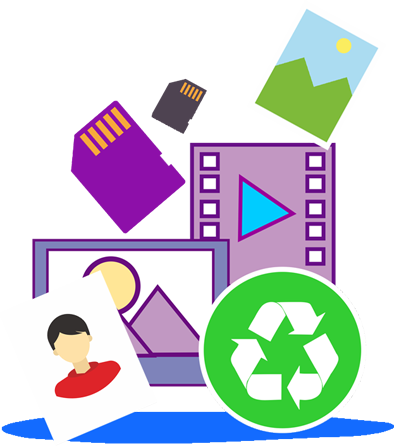 With exception of PhotoRec, most good file undelete and photo recovery programs are self-explanatory (especially R-Undelete, which features a step-by-step process for recovering files from a disk). The actual steps you’ll take will vary depending on the software you are using, but the principle is the same. Essentially, the delete and format operations that your digital camera performs are very basic. When you delete photos from your digital camera, you’re not really erasing them, as you would erase a chalkboard. You aren’t left with a clean slate. Rather, the camera is marking the disk space on the card as “okay to overwrite.” That is, when the camera (or another device) needs the space, it’ll go ahead and overwrite the space currently occupied by your photo, as if it wasn’t there at all (in fact, you won’t see it when you view the memory card on your camera or computer). What does this mean? It means that until something overwrites that old data, it is still there. You can go and retrieve it just as easily as you could pluck a newspaper out of a trash can. That’s what the aforementioned photo recovery/file undelete programs do. So, what if you’ve gone and formatted your disk? Again, all is not lost. Formatting a card basically establishes the file system for the card and prepares it for new data to be written. While it may change the file structure on the card, it doesn’t immediately delete the data that’s on the card. The best thing you can do to increase your chances for a successful file recovery is to stop using your SD card immediately. Do not take any more pictures and do not copy any files to the card. If you read the explanation above, you’ll understand why. This is true for recovering deleted files from any type of disk, but it’s particularly critical for SD cards, which tend to have smaller capacities than other disks. With less free disk space available, it’s far more likely that your data will be overwritten if you take more pictures. If you have a card reader for your computer, you should use it, rather than the USB or FireWire connection for your camera. You should also use a program that uses read-only access (such as PhotoRec and R-Undelete). Some programs will write small amounts of data to a disk when it is mounted or being accessed, so stick to the safe ones mentioned above. If you have a choice, format your SD cards in FAT. FAT file systems are the easiest to recover deleted photos from. Of course, if you are thinking this far ahead, you should just remember to backup/export your photos on a regular basis. One last note: if your SD card is physically corrupted or has some other fault, your photos are likely gone forever. SD stands for Secure Digital, meaning that there is hardware encryption going on during read and write operations. If the SD card starts to fail on an electrical level, you won’t be able to image it and salvage data from it like you could from a hard disk drive or a CD or DVD. If your SD card is showing signs of failure, replace it immediately!